Gourmet doughnuts with sophisticated flavours, high quality ingredients that are preservative free and made using local and organic ingredients whenever possible. Jelly Modern also strives to be eco-friendly and their contemporary café’s use bamboo materials and recyclable packaging, eco-friendly cutlery trying to reduce their carbon footprint. When I entered the store it was minimal, inviting and decorated in a monochromatic white. 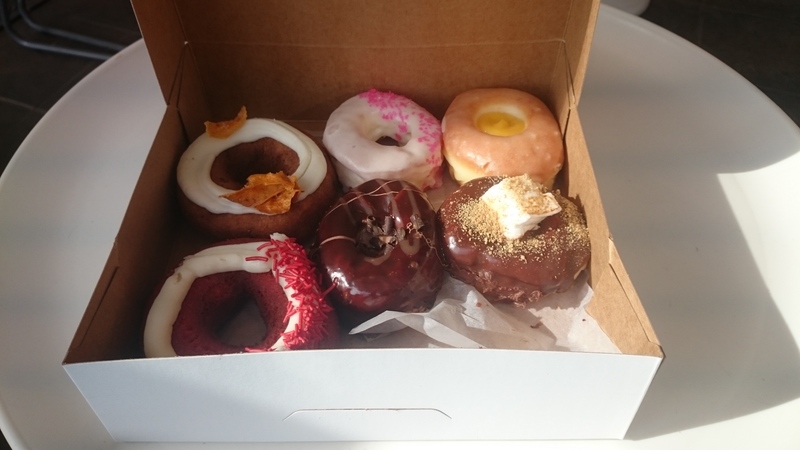 The doughnuts I purchased were: Cake: carrot cake, red velvet; Hand Dipped: Madagascar vanilla; Hand filled: lemon curd, s’mores and the Doughnut of the month: chocolate chocolate chocolate and more chocolate. 6 doughnuts went for $17. I found the doughnuts to be just okay. They tasted good but nothing to write home about. 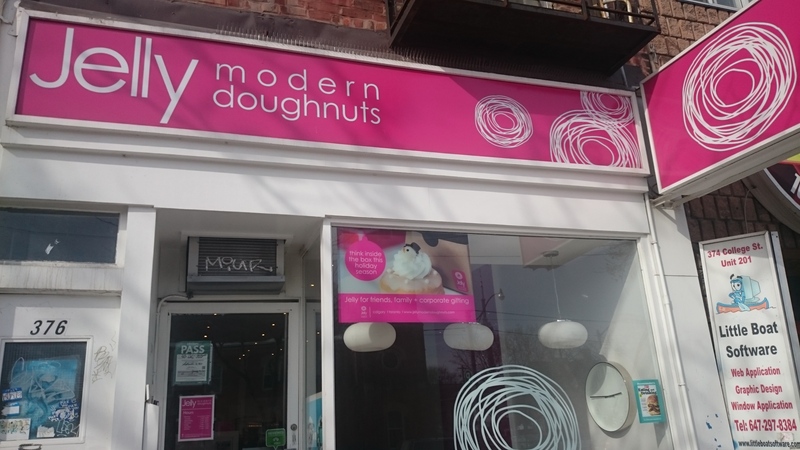 I know lots of people love this store and if I had visited here before glory hole doughnuts they would have been number one on my list in the city; as they have great toppings and flavour selections etc. Quite frankly though I think I have been spoiled with glory hole and nothing I have found yet in the gourmet doughnut world will change that. The cake doughnuts I found the most peculiar as I love carrot cake I of course grabbed a carrot doughnut; but when I bit into it firstly the batter was still white but had all of those carrot cake spices in it along with some carrot pieces. This threw me off as I was expecting a dark batter like a real carrot cake and the cream cheese frosting had thinly sliced carrot strips. This added a great decoration but again I no real flavour. Mr. C. agreed the red velvet doughnut was off in same way also. I did enjoy the vanilla and lemon curd much more as well as Mr. C. enjoyed the s’mores and chocolate, but we just found ourselves comparing to glory hole which means they are still our fav’s.